Throughout the history of the Capitals, there have been many players who have made headlines in not only Washington, but the NHL as well, due to their play or accomplishments. In this piece, NoVa Caps’ Diane Doyle takes a look back at the career of one of those players, Bobby Carpenter. Bobby Carpenter was born on July 13, 1963 in Beverley, Massachusetts, but grew up in Peabody, Massachusetts. The Capitals drafted him third overall in the NHL Entry Draft of 1981. He was the first American player to be drafted in the first-round and was the first player to jump directly to the NHL from high school after being drafted. He played for St. John’s Preparatory School in Danvers, Massachusetts. In the February 1981 issue, popular magazine Sports Illustrated published a cover story on him that chronicled his potential. He was the first American-born player to be featured on the cover of the magazine. Prior to joining the Caps, he represented the United States in the World Junior Championship in 1981, scoring five goals and adding four assists in five games played in the tournament. The Caps traded up in the 1981 NHL Entry Draft for the right to draft him, as originally, they had the fifth overall pick, but then-General Manager, Max McNab, traded the pick and their second-round pick to the Colorado Rockies (now the New Jersey Devils) for the third overall pick. Prior to the draft, most observers assumed that the Hartford Whalers, who had the fourth overall pick, would select Carpenter. However, the Caps surprised the hockey world by trading up in the draft and selecting him. After being drafted, Carpenter made the team out of training camp and played in all 80 games of the 1981-1982 season, scoring 32 goals and adding 35 assists for 67 points; however, he finished with a mediocre minus-23 rating. This was during a year in which the Caps went 26-41-13 for 65 points and finished fifth in the Patrick Division and well out of the playoff picture. The next season (1982-1983), he had 32 goals and 37 assists for 69 points and was an even plus/minus. The team improved to 39-25-16 for 94 points, third place in the Patrick Division, and their first ever playoff berth, but fell to the New York Islanders in the Division Semifinals. During the 1983-1984 season, he had 28 goals and 40 assists for 68 points overall, as the team once again made the playoffs. This time they had a 48-27-5 record for 101 points and a second-place finish in the Patrick Division. They advanced past the Philadelphia Flyers in the Division Semifinals, but again fell to the New York Islanders in the Division Finals. He had his best season during the 1984-1985 season, when he scored 53 goals, and had 42 assists for 95 points overall. He, along with Mike Gartner, who had scored 50 goals that year, were referred to as the “Gold Dust Twins”. Carpenter became the first U.S. born player to score over 50 goals during a single season, eclipsing the previous “Most Goals Scored by American” held by Joe Mullen. Carpenter was also selected to play in the All-Star Game that season. The season was another good regular season for the Caps, who finished 46-25-9 for 101 points and finished second in the Patrick Division for the second consecutive year, but was followed by another first round playoff exit, losing to the New York Islanders in the Division Semi-Finals, their third consecutive year of being eliminated by the Islanders. After the season, he was rewarded with a new three-year contract, valued at $1.3 million. The 1985-1986 season was not as good for Carpenter, as he scored 27 goals and had 29 assists for just 56 points. While it would have been a good season for many players, it was a letdown from his typical productivity, to that point in his career. He and Coach Bryan Murray did not see eye to eye. One of the conflicts was that Murray played him at left wing, even though his natural position was center. Prior to the season, he had bought a house, gotten married, took some college courses and did not play summer hockey, so his focus was not just on hockey. Things deteriorated even more the following season. After 22 games, he had scored just five goals and seven assists and his relationship with Murray continued to decline in the process. On November 22, the Caps lost 5-4 to the Pittsburgh Penguins, extending a losing streak to seven games, via a 0-4-3 record, and their longest losing streak in three years. On the afternoon of November 24, after the team’s practice, General Manager David Poile met with Carpenter and suggested that the Caps and he part ways with one another. Given the state of his relationship with Murray, Carpenter agreed, admitting to Washington Times writer David Fay, “I think everybody knows that Bryan and I don’t get along. I think that’s pretty obvious and that’s a good reason why I wouldn’t mind leaving.” The Caps sent Carpenter home until a trade could be worked out. The next day, Poile phoned Carpenter at his home and told him not to report to practice since his services were no longer required. Bryan Murray, meanwhile, said, “As far as the coaching staff and the players are concerned, we’ve got to go on and try to win some games, and having an unhappy player in practice doesn’t seem to be in our best interests, so we had to protect ourselves.” The fact that the Caps were slumping during that time contributed to the decision to send Carpenter home rather than having him practice and play with the team until a trade could be worked out. Until being dismissed by the Caps, Carpenter had played in 422 consecutive games, which was then the second-longest streak in the league, after former Capital, Doug Jarvis. He did not play hockey again until he was traded to the New York Rangers at the start of the new year (January 1, 1987), with a second draft pick, in exchange for three forwards: Mike Ridley, Kelly Miller, and Bob Crawford. As part of the deal, the Rangers would pick up the last two years of Carpenter’s contract. At the time of the deal, the Rangers’ plan was to have him play center, but he would have to earn his way to the top-line. In the end, Carpenter did not finish the 1986-1987 season with the Rangers. Instead, he and defenseman Tom Laidlaw were traded to the Los Angeles Kings for Marcel Dionne, who had then scored the second-most points during his NHL career, left wing Jeff Crossman, and a second-round pick. During his brief time with the Rangers, he had two goals and eight assists in 28 games. He finished the year by scoring two goals and three assists in 10 games played and played for the Kings in the playoffs. His totals for the tumultuous 1986-1987 season were nine goals and 18 assists for 27 points in 60 games played. He played the entire 1987-1988 season for the Kings, during which he had 19 goals, 33 assists, and 52 points overall in 71 games played. He started off the 1988-1989 season with the Kings and had 11 goals and 15 assists for 26 points in 39 games when he was traded again, this time to the Boston Bruins, on January 24, 1989, in exchange for center Steve Kasper. At the time of the trade, Carpenter had not played in nearly a month due to a broken bone in his right hand. He played in his first game for the Bruins on February 14, 1989. He played in 18 games for the Bruins that year, scoring five goals with nine assists for 14 points overall. His totals for 1988-1989 were 16 goals and 24 assists. He also played in the playoffs that season for the Bruins. He played three more years with the Bruins, during which time he had 25 goals in two of them (1989-1990 and 1991-1992), but scored only eight goals during an injury-shortened season in 1990-1991. He had shattered his knee in a game on December 9, 1990. During the 1989-1990 season, he was part of the Bruins team that made it to the Stanley Cup Finals. He scored three goals in Round 1, when they eliminated the Hartford Whalers. He scored one goal in Round 3 in which they, ironically enough, eliminated the Caps. 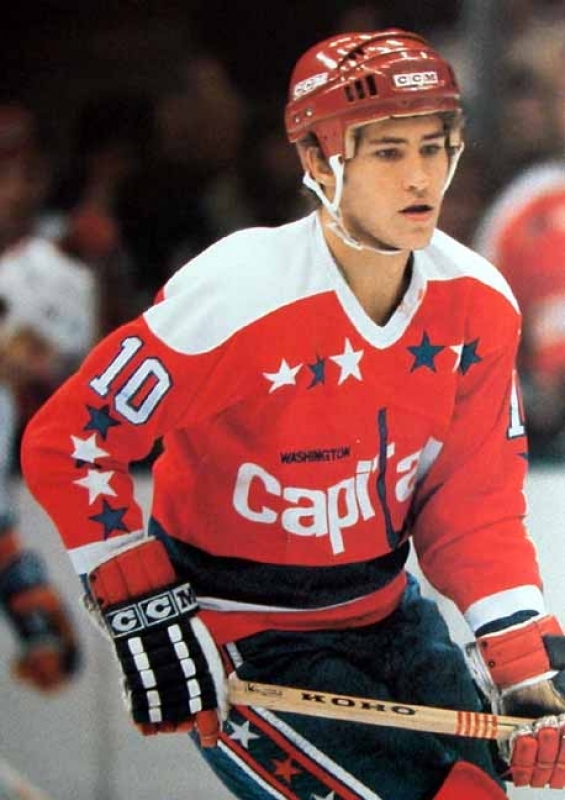 In 1992-1993, he returned to the Caps as a free agent for a single season, during which he had 11 goals and 16 assists and 33 points overall. After that season, he joined the New Jersey Devils, with whom he played for six seasons until the 1998-1999 season, after which he retired at the age of 35. The Devils won the Stanley Cup in 1995, and made it to the Eastern Conference Finals in 1994. For his NHL career, he finished with 320 goals and 408 assists for a total of 728 points in 1,178 games played. 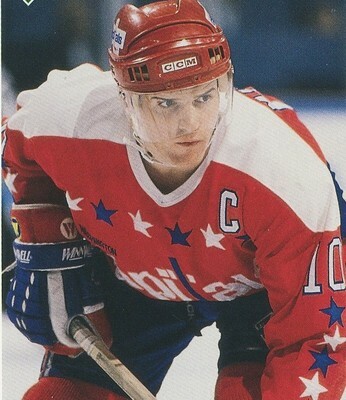 During his tenure with the Capitals, he scored 88 goals and 207 assists for 395 points in 490 games played. Following his retirement, he coached the Albany River Rats of the American Hockey League, serving as both Assistant Coach and Associate Coach, becoming their head coach for the 2002-2003 season. He was an Assistant Coach for the Devils for the latter part of the 1999-2000 season; the Devils won the Stanley Cup in the 2000 Stanley Cup Playoffs. He returned as an Assistant Coach for the Devils for the 2002-2003 season, after which they won the Stanley Cup. He remained with the Devils for one more season, the 2003-2004 season. After that, he worked as a Consultant and Player Development Coordinator for the Toronto Maple Leafs for six seasons, from 2008-09 through 2014-2015. He would serve as a Development Coach for players drafted into the Leafs organization until they turned pro, keeping track of their progress in Canadian Junior Hockey and in colleges in the United States. At the same time, he served as Director of Program Development for the Valley Jr. Warriors of the Eastern Junior Hockey League. He is currently an assistant coach for the Kunlun Red Stars team in the KHL, working under Mike Keenan. The team is in their second year of existence and plays in Shanghai, China. Besides coaching, other activities he has done after his playing career was running in the Boston Marathon. He originally ran it in 2016, finishing it in three hours and 47 minutes. He ran it again in 2017, this time pushing the wheelchair of female hockey player, Denna Laing, who was paralyzed by an injury suffered in the 2016 Outdoor Women’s Game. In a special racing wheelchair, they finished in 4:32:30. Bobby and his wife, Julie had three children. The first born was Alexandra “Alex” Carpenter who was born on April 13, 1994. Like her father, she was also a great hockey player. She played hockey with Boston College from 2011 through 2016, taking a year off from the team to play in the Olympics in Sochi, Russia, in 2014. In her junior year, she won the Patty Kazmaier Memorial Award, which is awarded to the Best Female hockey player. She has represented the United States, not just in the Olympics, but also in the World Under-18 Championships and the World Championships and has received either Gold or Silver each time. She has played professional Women’s hockey with the Boston Pride and is expected to play in the Olympics in 2018. Their second child was Robert “Bobo” Carpenter, who was born on August 16, 1996, and is currently a junior at Boston University and playing on the hockey team there. Their youngest child, Brendan Carpenter, is currently a junior at Endicott College and playing football for them. Former Capitals Star Bobby Carpenter and Former Female Hockey Star Deanna Laing Finish Boston Marathon. This entry was posted in History, Players and tagged Bobby Carpenter, Boston Bruins, Diane Doyle, Los Angeles Kings, New York Rangers, News, Washington Capitals Alumni. Bookmark the permalink.